If you’re an online shopper then you know waiting for your package can be a stressful event. Most people don’t have time to stay at home until their package arrives. We’ve got a solution. 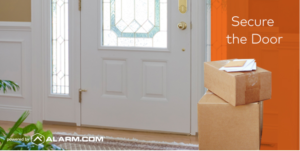 With our smart security system, you can secure a package from anywhere. Most delivery carriers ring the doorbell when your package is being delivered. If you have smart security that means seeing who is in front of your door from your phone when the doorbell rings. Similar to a video chat, you can verbally and virtually correspond with the delivery person (or any other person at your door). Once you’ve verified who’s at your door, you can decide whether you want to unlock your front door to place the package inside or simply view it safe and sound at your doorstep. Everything can be done from your phone. If you decide to have the package placed inside, make sure to lock the door, arm the security, and say goodbye to the deliverer! How common is package theft? According to USATODAY, about 30% of Americans say they have experienced package theft. A criminal sees this as a risk free crime. They do not need to enter the home. Instead, the criminal grabs and goes! If your package does get taken, our surveillance system will catch the motion and record a video. 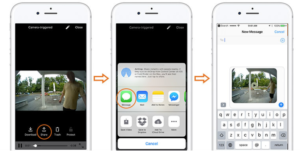 You’ll receive the footage directly to your phone. In general, thieves try their best to avoid homes with security systems in hopes of not being caught. Want to protect your packages? Connect with a SFI team member here.